Make your own chocolate mint cookies. Photo courtesy Chocolat Celeste. The Girl Scout Thin Mint Cookie has become somewhat iconic. But bite into one today, and you wonder why. It tastes like an average supermarket cookie—nothing a cultured palate would want. Chocolatier Mary Leonard, of Chocolat Céleste, applied her skills to creating a thin mint cookie that consumers of her fine chocolate truffles would enjoy. 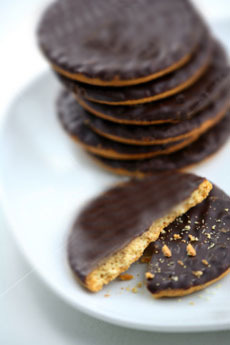 Now you don’t have to wait for Girl Scout cookie season to enjoy Thin Mint-style cookies. And these taste so much better! In a small bowl, whisk first 4 ingredients. In a large bowl, cream together butter and sugar. At low speed, mix in the milk & extracts. Mixture will look curdled. Gradually, add in the flour mixture until incorporated. Shape dough into two logs, about 1 1/2 inches in diameter, wrap in plastic wrap & freeze for 1-2 hours, until dough is very firm. Slice dough into rounds not more than 1/4 inch thick and place on a parchment- lined baking sheet. Bake for 13-15 minutes. Cool cookies completely before dipping in chocolate. Over low heat in a double boiler, combine chocolate and butter stirring frequently, until chocolate is smooth. Chocolate should have the consistency of chocolate syrup. Remove from heat. Dip each cookie in melted chocolate. Turn with a fork to coat, then transfer to a piece of wax paper to set for at least 30 minutes, or until chocolate is cool and firm. Reheat chocolate as needed. Recipe © Copyright Chocolat Céleste.We regret that this artisan chocolatier has since closed its doors.